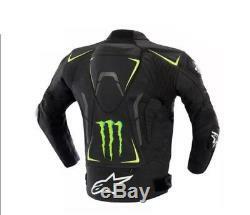 Monster Energy Motorbike / Motorcycle Leather Jacket In Cowhide. Made of Genuine Cowhide Top Grain Leather 1.3 mm to 1.4 mm. CE standard protectors on Shoulders, Elbows and Back. Rubber padding for safety on significant parts. Pre-Curved Professional Sleeves for Perfect riding situation. Safety Seems all pressure Point (triple Stitch). Removable All armor at shoulders, and elbows. Comes off twin density backbone protector. It is very important that, you cross check your measurements carefully before placing an order. Size charts is available with detailed information for measuring your size. Size Chart for Mens Motorbike Jacket. All Sizes in CENTIMETER (CM). Russia takes 12 to 15 days. Custom made items and special deal orders not returnable or exchangeable. Item color displayed in photos may be showing slightly different on your computer monitor since monitors are not calibrated same. We keen to serve the supreme quality products and services in order to validate the desires and expectations of our valuable customers. FOR WHOLE SALE BULK ORDER. WE WILL DEAL ON BEST WHOLE SALES PRICES. 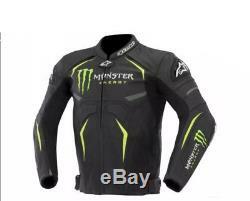 The item "Alpinestars Monster Energy Motorcycle Leather Jacket" is in sale since Monday, April 30, 2018. This item is in the category "Vehicle Parts & Accessories\Clothing, Helmets & Protection\Motorcycle Clothing\Jackets". The seller is "biniek47" and is located in Ilford, Essex. This item can be shipped to North, South, or Latin America, all countries in Europe, all countries in continental Asia, Australia.